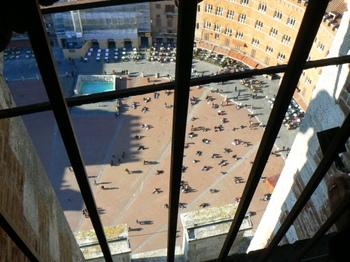 We had clear blue skies for our long weekend in the medieval Tuscan city of Siena. It was beautiful, but it was FREEZING. Of course, that didn't keep us from exploring the city from top to bottom. We just made sure we were properly bundled up each day before heading out for our walking excursions. 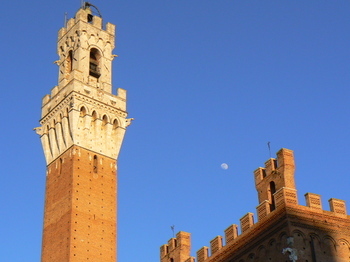 The Torre del Mangia dominates over the famous Piazza Il Campo, where the Palio Festival takes place twice each year - on July 2nd to commemorate the miracles of the Madonna of Provenzano, and on August 16th to honor the Assumption of the Virgin. According to a tourist magazine we came across in our hotel, "The tower owes its strange name to the bell-ringer's nickname, called "Mangiaguadagni" (Moneyeater), who in 1347 was in charge of ringing the bells to sound the hours." 400 steps led us to the top of the 87-meter high Torre del Mangia, where we took in a nice view of the Piazza Il Campo, where people seem to congregate at the alfresco cafés or seated on the ground, even in this cold weather. 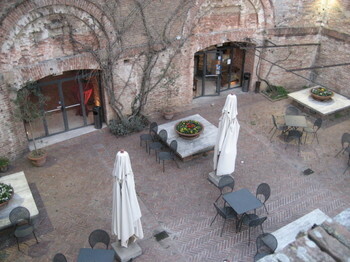 We trekked outside the walls of the historical center of Siena to see what we could find. 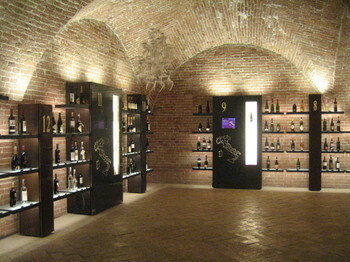 The first place we ran into was the Enoteca Italiana, which is a public institution established in 1960 to promote the great wines and wineries of Italy. 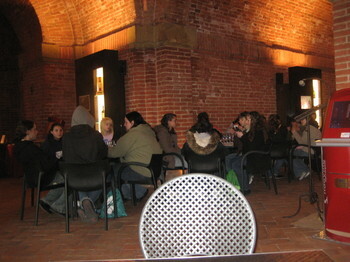 We ordered a couple glasses of vino and then stepped out onto the beautiful, deserted terrace to enjoy the wine in peace as we watched a group of high school aged kids come in for an important lesson in wine tasting. I don't remember taking any field trips like that when I was in high school. Another place we came across outside the walled-in city was the Basilica di San Domenico, the 13th – 15th-century Gothic church where Santa Caterina, the patron saint of Siena, had experienced a series of mysterious trances. Apparently, St. Catherine was instrumental in returning the papal seat to Rome from Avignon in the 14th century. She was beloved by the people of Siena, who found a way to keep a part of her with them for all eternity. 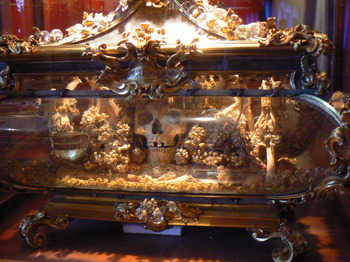 I took this picture, illicitly, in the Basilica di San Domenico, and I thought it was the skull of St. Catherine. However, after seeing photographs of her head online, I'm not sure this is really her. So, a mystery unfolds. Who is it ? I'll report back when (if) I figure it out. UPDATE: I still don't know whose skull this is, but I just remembered that I took the picture in the Duomo - not in the Basilica di San Domenico.